Crystal clear vials for health food supplements, vitamins, capsules, and pills. Our polystyrene vials are great for packaging health food supplements, vitamins, capsules and pills. Any products that do not need to have child-resistant packaging look great in these vials. 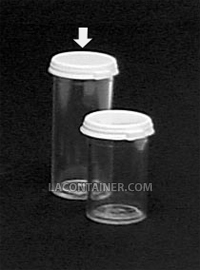 These crystal clear vials have a high gloss finish and are capped with a white polyethelene snap-cap. Straight wall design lends itself to the application of transparent decals or paper labels. 20.6mm Dia. X 52.4mm Ht. 13/16" Dia. X 2 1/16" Ht.